134 p., 15,5 x 23,0 cm. With contributions by Ansgar Beckermann, Jörg Bernardy, Geert Keil, Jasper Liptow, Mathias Obert, Gerson Reuter and Daniel Schubbe. The paper investigates how art, instead of providing »insight« into reality, rather opens up an existentially effective access to the world through aesthetic experience. As recent artistic developments engage in unsufficiently understood phenomena of »performativity«, the case of Chinese inkwash painting is brought into this debate as a theoretical case study, in an attempt at transcultural reflection. With the idea of an »aesthetics of transformation«, it is shown how the aesthetic experience of paintings may free the onlooker for his or her existential situation in the real world; it is then pointed out what this means for the theoretical status of a picture and traditional theories of pictorial mimesis. Positions of contemporary aesthetics and media theory as well as premodern Chinese texts are put forward and contrasted in order to demonstrate why common theories of pictures, especially the thesis of an immersion into the image, are misleading about ancient Chinese paintings as well as about some developments of contemporary art. The article is a comment on Ansgar Beckermann’s compatibilist conception of free will. Beckermann argues that libertarian conceptions fail to render free will intelligible. By denying determinism, they are left with two uncomely options: agent causation and sheer luck. I agree that agent causation is hard to make sense of and that the luck problem is a major challenge to libertarianism. Yet it is far from clear whether compatibilism is better off. Compatibilism comes in two types, i.e., with or without commitment to determinism. Deterministic compatibilists do not face the luck problem but they are left empty-handed should determinism turnout to be false. Agnostic compatibilists have to explain what it means that choices and actions depend on the agent’s reasons and attitudes without being determined. If any weaker connection than deterministic causation is called »random«, then agnostic compatibilists face the luck problem, too. The idea that only those things can happen that actually do happen (determinism) seems to be incompatible with the idea that a person can act or decide otherwise than she actually does. If being able to act otherwise is a necessary condition for freedom, freedom and determinism seem to be incompatible. A common compatibilist strategy, which Ansgar Beckermann pursues in his Gehirn, Ich, Freiheit (2008), attempts to reconcile the two ideas by pointing to an ambiguity of the verb »can«: in the first case, »can« is said to express the possibility that some event happens; in the second case, it is taken to express a person’s ability to do something. It is shown that the compatibilist strategy runs into trouble because, albeit »can« does in fact have these two meanings, reference to abilities is of no help in explicating the »principle of alternative possibilities«. One of the central claims in Ansgar Beckermann’s Gehirn, Ich, Freiheit is that we are biological beings. Somewhat strikingly, the book manages to convey the impression that this is a rather uncontroversial claim. Actually, the opposite is closer to the truth – or so I will try to argue. That it is a controversial claim can be shown by pointing out some of its problematic and seemingly implausible consequences. These consequences come into view by attempting to answer the questions, what biological beings exactly are, and which conditions of diachronic identity they have. Highlighting these problems, I do not try to argue against the claim that we are biological beings, though. In the first place, it shall simply gain profile. Secondly, some options for solving these problems are discussed. In this way, the paper contributes to a defense of the claim that we are biological beings. For although this claim raises serious theoretical problems, it is most likely true. 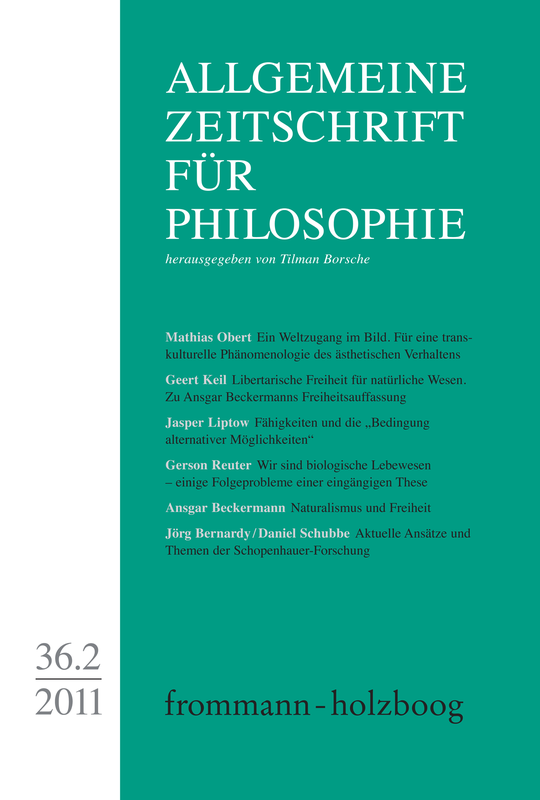 This article is a reply to the comments on my book Gehirn, Ich, Freiheit by Geert Keil, Jasper Liptow and Gerson Reuter. My main concern is to show that we humans may be free and responsible even if we are thoroughly natural beings. But what exactly is a thoroughly natural being? In section 1, I try to answer this question by elaborating in more detail what, in my view, naturalism amounts to. In sections 2 and 5, I address the question what it may mean for natural beings to be able to act or decide otherwise. In section 3, I distinguish two versions of libertarianism which I call ,standard‘ and ,non-standard libertarianism‘; furthermore I explain some of the main problems non-standard libertarians are confronted with. Section 4 is devoted to Geert Keil’s version of non-standard libertarianism. My main objection to this theory is that Keil has so far given no answer to the questions why a process of deliberation ends when it ends and what it may mean that a person is able to continue deliberating. Jörg Bernardy / Daniel Schubbe: Aktuelle Ansätze und Themen der Schopenhauer-Forschung. This report provides a systematic overview on the key topics of scholarly research on Arthur Schopenhauer within the last ten years. It is mainly concerned with the neurosciences, psychoanalysis, with the arts of the 19th and 20th centurie as well as with hermeneutics, and the philosophy of existence.